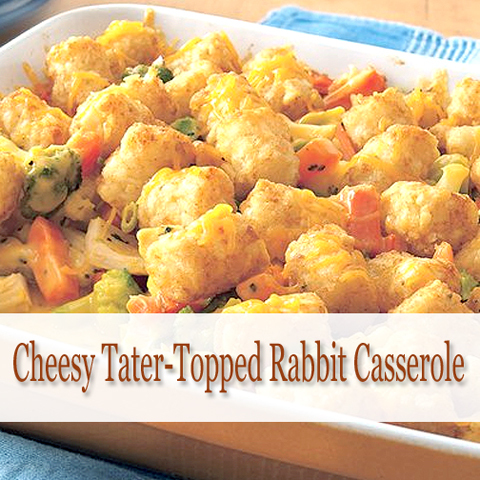 We bring you the Cheesy Tater-Topped Rabbit Casserole recipe today. A quick and easy meal you can throw together anytime. In an ungreased 11×7-inch baking dish, place broccoli, carrots, cauliflower and cheese sauce. Microwave uncovered on High 3 to 5 minutes, stirring once, until thawed. Stir well until cheese sauce is melted. Bake uncovered 40 to 45 minutes or until bubbly around edges and potato nuggets are golden brown. Sprinkle with cheese and remaining 1 tablespoon onion. Bake 5 to 10 minutes longer or until cheese is melted.